1 - The US cut starts with this scene. 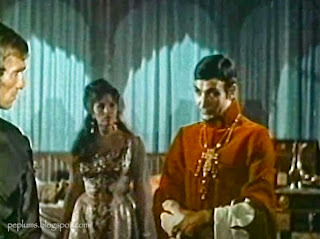 Gordon Mitchell's character and his concubine talk about how he was infatuated with Fatima, the Bella Cortez character. They argue about this. We wonder who they are talking about. Very odd way to start a film. 2 - We then see two men tortured for information. We don't know who these men are. 3 - The torturer tells Gordon Mitchell that Ali Baba will be arriving soon and Mitchell tells the torturer to send soldiers to greet Ali Baba. 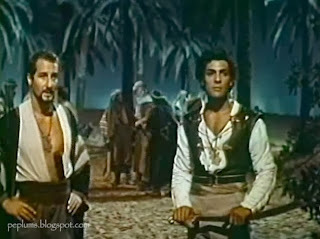 4 - Ali Baba waits with his men. They are ambushed by Mitchell's henchmen. 5 - Gordon Mitchell then inspects the men who will be part of a tournament. 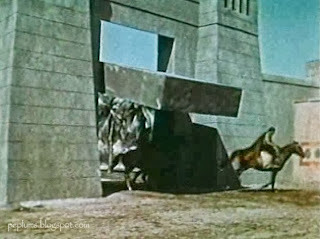 6 - We then see men on horseback arriving at Mitchell's palace, with two men in chains. 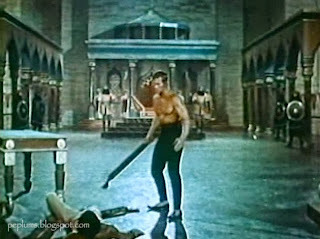 7 - The next scene shows Mitchell practicing his sword play. 8 - The following scene shows Gordon Mitchell meeting members of different tribes including one headed by Bella Cortez, whom he's infatuated with. They also talk about the upcoming tournament. 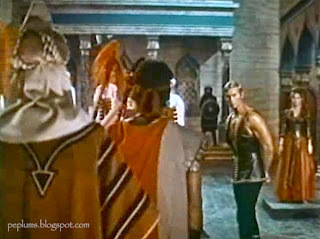 They also meet the two men who were captured as seen in scene 6. As you can see the whole order of sequences is illogical. 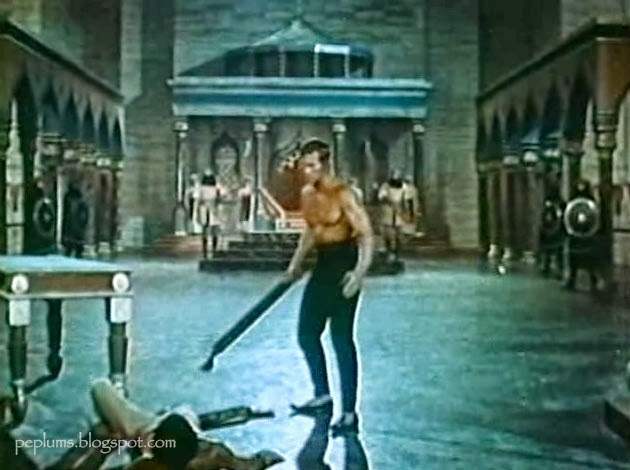 The film is supposed to start at scene 6, with the men on horseback arriving to the palace with the two men. 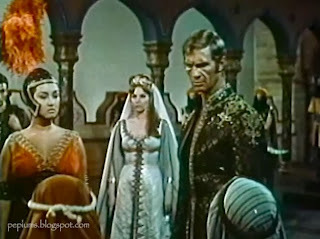 7 and 8 follow correctly and then it should be followed by scene 1, where Mitchell and the concubine argue over Mitchell being infatuated with Fatima/Bella Cortez (scene 8). It doesn't make any sense to start the film with scene 1. The two kneeling men we see in scene 8 are the two men tortured in scene 2. Also in scene 8 they talk about who's going to be part of the tournament, the very men we see in scene 5. The correct order is scene 6, 7, 8, 1, 2, 3, 4, 5 which continues correctly for the remainder of the film (at the 20 minute mark). There are a few other scenes that needed to be re-arranged but the bulk of the messed up sequences are those listed here. Whoever re-arranged the actual order of those scenes for US TV was either drunk or plain stupid. This messed up cut of ALI BABA AND THE 7 SARACENS is the ONLY copy sold in North America or viewable on Youtube (well, except mine). It's amazing that no one has noticed this by now. I fixed the film and unsurprisingly the quality of it improved as well. THANKS ... I always thought this was one of the weakest films of the genre ... I will take a second look thanks to your keen eye and editing skill! 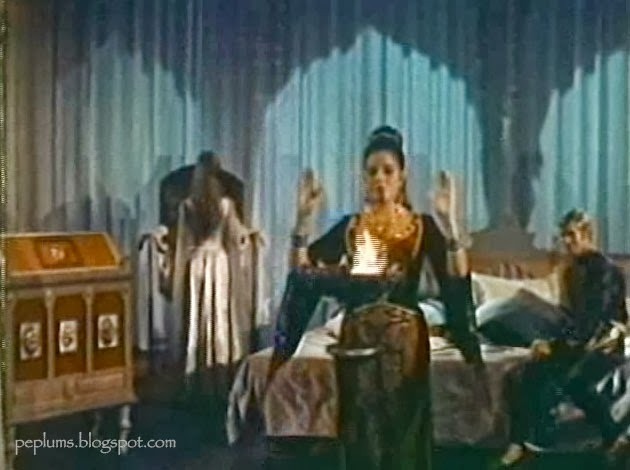 I recognized a couple of musical cues, one definitely from KALI YUG, LA DEA DELLA VENDETTA. The film works when Gordon Mitchell or Bella Cortez are around, particularly Mitchell. The hero, either Sinbad or Ali Baba depending on the version, is fairly ineffectual. In the climatic match-up between him and Omar, he doesn't win, but luck has a chariot run over Omar. If the running time on the IMDB is correct, there's a good bunch cut out of the American TV version. Thanks for making this more comprehensible, though the film is still a lesser peplum with unintentionally ridiculous bits. I was hoping the midget would get perpetually lost in the tunnel system. Now I finally understand what's happening. Thanks for your very good work, and now I don't have to scratch my head.